This recipe was used in our review of the RangeKleen 12” Deep Fryer. It comes from the cookbook, A Skillet Full of Traditional Southern Lodge Cast Iron Recipes & Memories compiled by the Historic Preservation Society of South Pittsburg, Tennessee. 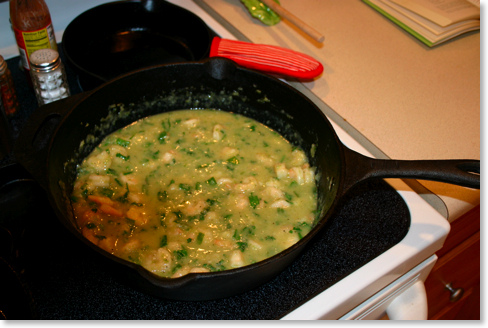 A Skillet Full is one of my favorite cast iron cookbooks, and I’ll post a full review of the book at a later time. I like the book because it uses an icon system to immediately identify what kind of cast iron cookware is needed in a particular recipe. Perhaps only true cast iron aficionados will truly appreciate this, but sometimes I want to make something in a particular cast iron pan. 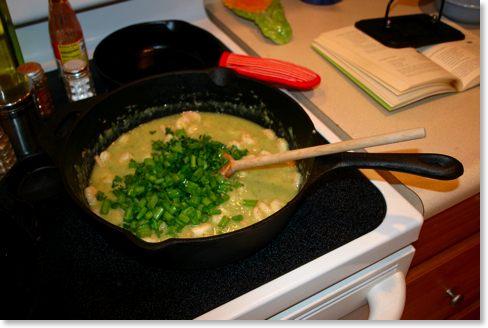 I can take A Skillet Full and scan the pages for an appropriate recipe for that pan. 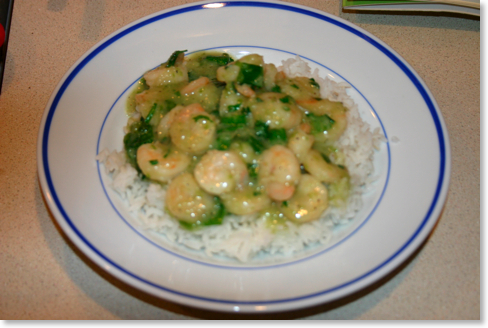 This particular recipe reminded me of a cajun étouffée. 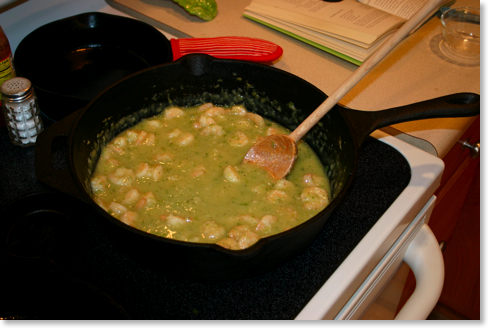 It uses butter and flour, but they aren’t browned as would be necessary in a traditional roux. Therefore, it’s a bit milder than an étouffée. I selected this recipe because I was looking for something to cook in a deep fryer besides something simply fried in oil. Technically, this recipe could be prepared in any cast iron skillet of at least 10 1/4” in size. However, the advantage of a deep fryer allowed me to stir the ingredients more briskly without worrying about it going over on the sides of the pan. 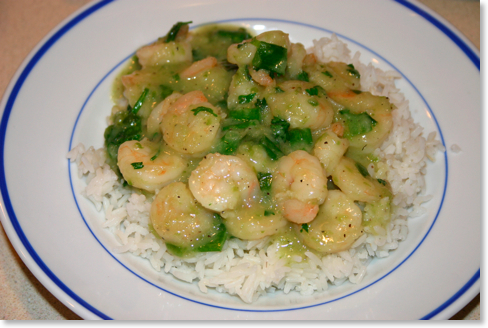 I also found it interesting that this recipe is called “Seafood & Rice” when it only calls for shrimp. Why not “Shrimp & Rice”? There are no additional notes about adding anything else, but there’s no reason you could not. The shrimp are good alone, but it might be fun to experiment with crab meat, clams, scallops, crawfish, or any combination of them. The recipe is extremely easy to make and the final result is quite impressive. Put butter in chicken fryer and melt over medium heat. 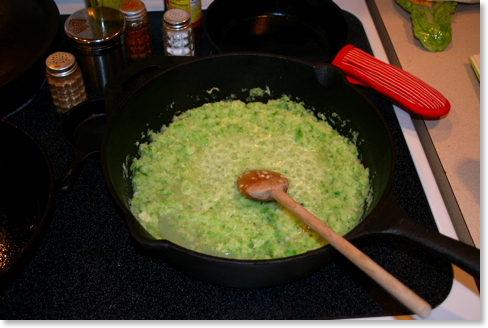 Add onion, celery and bell pepper. Cook 5 minutes, stirring constantly. 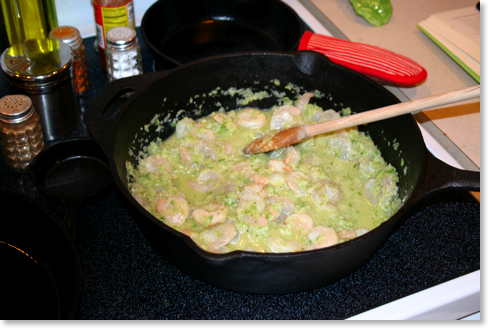 Add shrimp, salt, peppers, onion powder, and Tabasco. Cook 5 minutes; then add flour. Cook 2 more minutes, stirring constantly. Reduce heat to low and cook an additional 20 minutes, stirring occasionally. 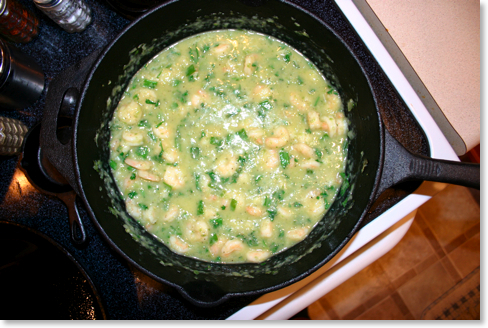 Mix in green onions, parsley, and cook for 3 minutes. Onion, bell pepper and celery cooking in butter. After the flour has been added. Adding in the green onions and parsley.